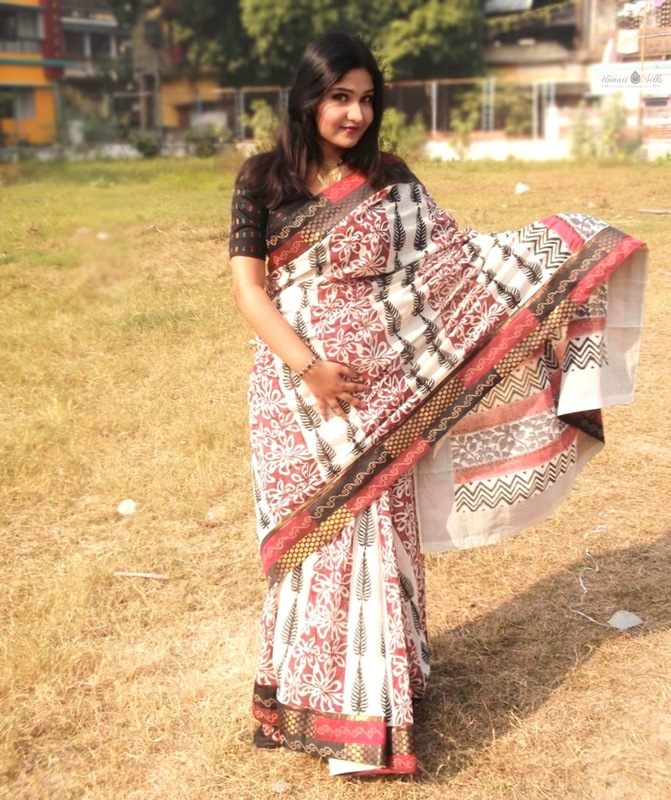 “I have seen you mostly in Saree ever since you started working “ said a friend . 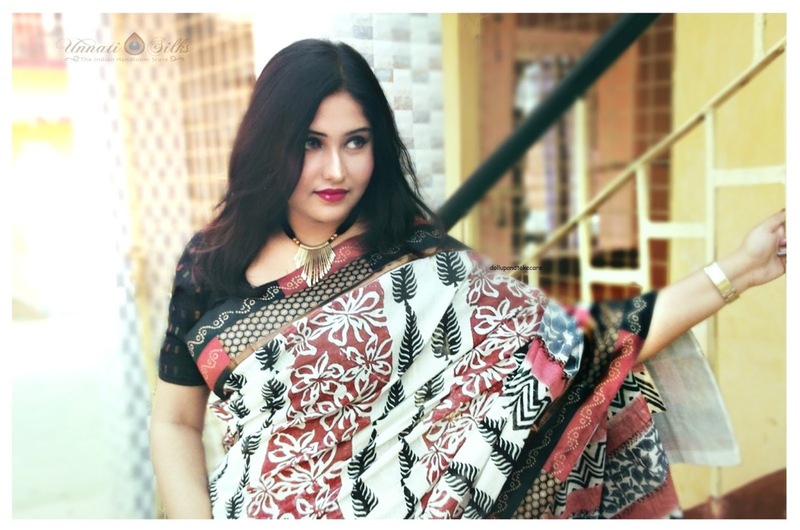 Drapping a saree was nightmare a couple of years ago ,but finding some other outfit for any occasion other than a saree is difficult for me these days.I do believe that love hate relationships are not just something that can happen only in movies .Ours have been a journey ,quite passionate . Unnati Silks played my Santa this Christmas ,I haven’t been well lately .Cotton sarees have always been close to my heart and all flowery to my comfort zone . can even use for occasions trust me happiness knows no bound . 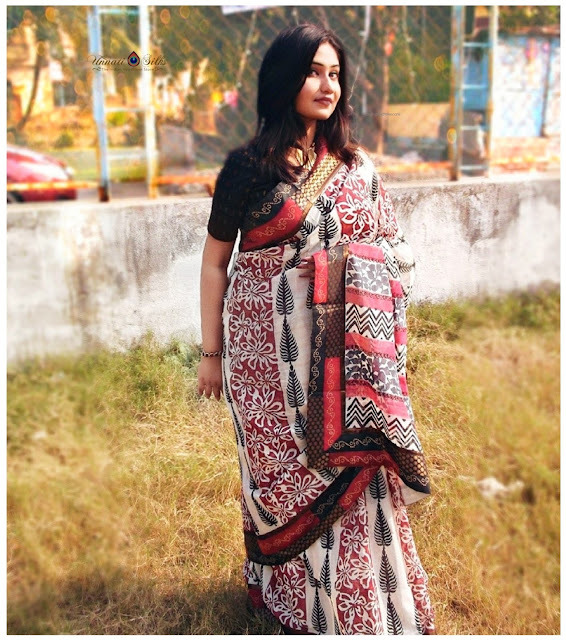 This lovely block print cotton saree is embellished with chanderi machine embroided patch work border . The color combination is so unique any age group can style it . Block printing is making use of a carved piece of wood or any other type of wooden block to imprint an image on fabric or paper. In the early days of printing, it was used to print entire books. Today the process of block printing is popularly associated with making designs on fabrics by printing on them, with the help of a block made for that purpose. Believed to have its origin in China, block printing has been in use around the world now, for quite some time. There is archaeological evidence that an early form of block printing on textiles existed in India as far back as 3000 BCE, during the period of the ancient Indus Valley Civilisation. It was not until the 12th century that the traditional art of block printing began to flourish. The states of Gujarat and Rajasthan are particularly renowned for manufacturing and exporting magnificent printed cotton fabrics. The art is not traditional to eastern India and was introduced to West Bengal in the 1940s. Highly skilled local craftsmen quickly mastered the textile art form. 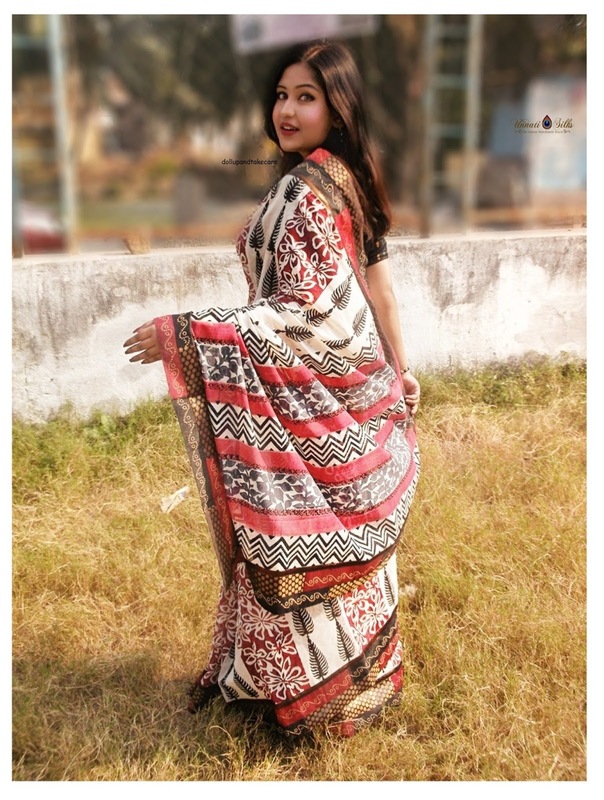 Today, as in the past, the main hubs for the manufacture and export of block printed fabrics and garments are Ahmedabad, Surat and the Kutch district in Gujarat and Jaipur, Bagru and the Barmer district in Rajasthan. 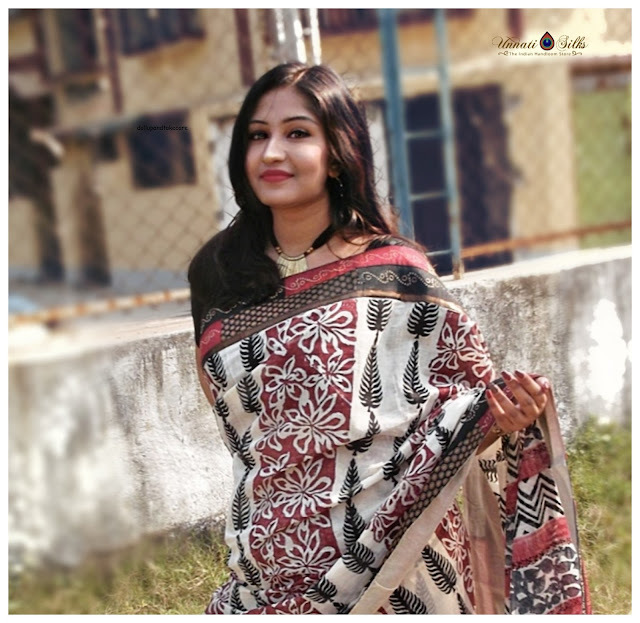 Today, Serampore city in West Bengal continues to be prominent in the production of block printed silk sarees and fabrics. 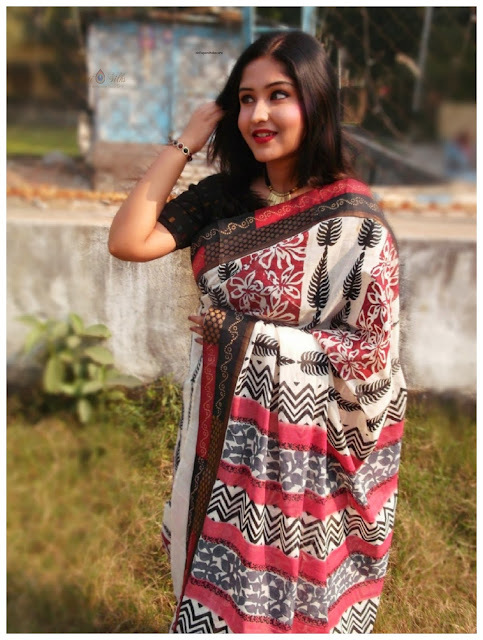 As in the 20th century, motifs and patterns from West Bengal are market driven, thus block printing from this state is young. 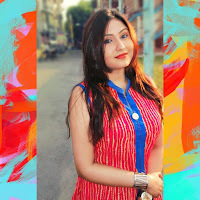 West Bengali block printed patterns adapt to contemporary fashion trends while Gujarati and Rajasthani block printed patterns perpetuate its tradtional motifs. Block printing is a form of textile art that diffuses itself into thriving cultures, at the same time enriching them. In the 17th century, the Mughal Emperor Shah Jahan and his court were widely known for their love of the arts. This gave motifs in block printing visibility to a wider audience in and outside of India. The British were in India from the early 17th century and were receptive to native culture even before the Raj formally came into being in the mid 19th century. 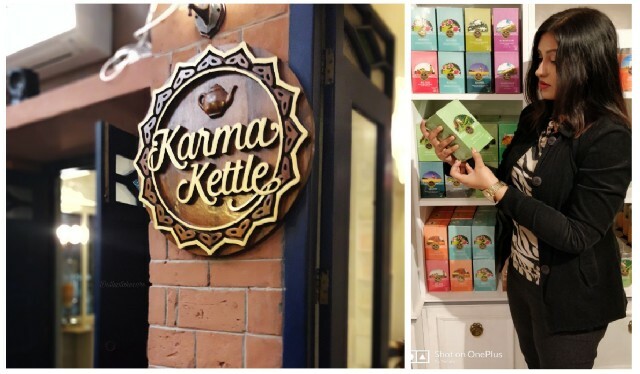 This popularised many floral and vegetal motifs, such as birds and the famous Paisley, or boteh or buta, design that can still be seen in contemporary motifs. Two centuries later, from the mid 1800s, the British Raj led designers from Britain to draw inspiration from these traditional Indian motifs. Thus the widely adored Paisley pattern became embedded into the culture and history of the Scottish town of Paisley, an established hub of the British textile and weaving industry which were ‘Cottage Industries' before the rise of the Industrial Revolution. The states of Gujarat and Rajasthan are regarded as the birthplace of Indian block printing and traditional techniques that are still used in the contemporary designs and colours. 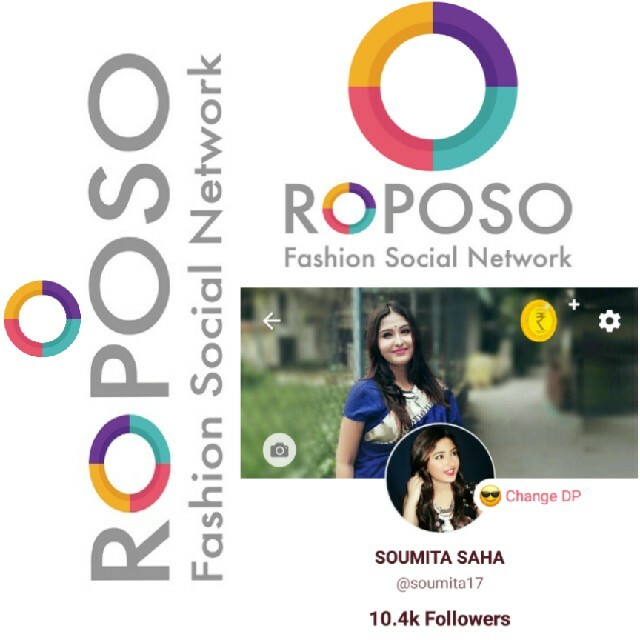 Unnati Silks is a saga of 'HANDLOOMS FOR WOMEN' that began in 1980. Three decades hence it has transformed from a single shop entity to become a family enterprise with extended arms and global operations. Customer - Centric that it is, Unnati Silks anticipates, innovates and provides with a strong belief that each and every customer is special and requires that something, which is unique, refreshing, fashionable and of quality. 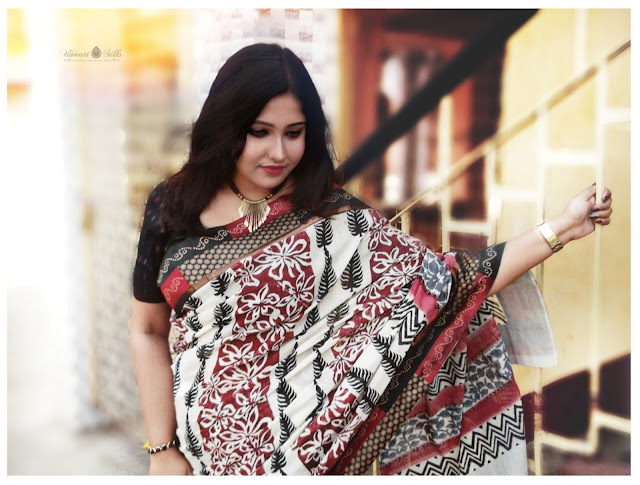 Having a product range that is as varied as it is vast, handwoven and handcrafted, the devotion and dedication of talented ethnic artisans from across 21 states of India comes through in the products on display. Having the Handloom Mark and Silk Mark for most of its products, Unnati's customers are assured a legitimate backing too, despite being guaranteed original handloom products from the start. Armed with an M.Sc. Gold Medal in Chemistry, sights on a career in Medicine, Mr. Ladha was all set to the beginning of a promising career and the dedicated life of a medical practitioner. Fate willed otherwise and a family situation cropped up that saw him drop his dreams and instead choose some other calling. It required a firm bent of mind and resolute will that saw him embark upon a journey to seek his luck in textiles. He has had no regrets at any time regarding the decision, instead feeling that Fate had lent him a helping hand in settling for something that has clearly paid off tremendously. Right from his student days he had developed a love for handlooms; fabrics that he considered as pure, having a smooth touch and vibrant feel. Distant relatives were already in the business of selling fabrics, most of which were handlooms. He was very much taken in by the traditional processes of Bagru&Dabu, the vibrancy of their colors, the efficacy of the hand block, the sharpness and detail of the prints, and of course with his love for Indian ethnic, he had a soft corner for the traditional artistry that ethnic practitioners displayed in the cotton and silk fabrics but as he felt ‘never got their place in the sun’ for the marvellous offerings that they created. 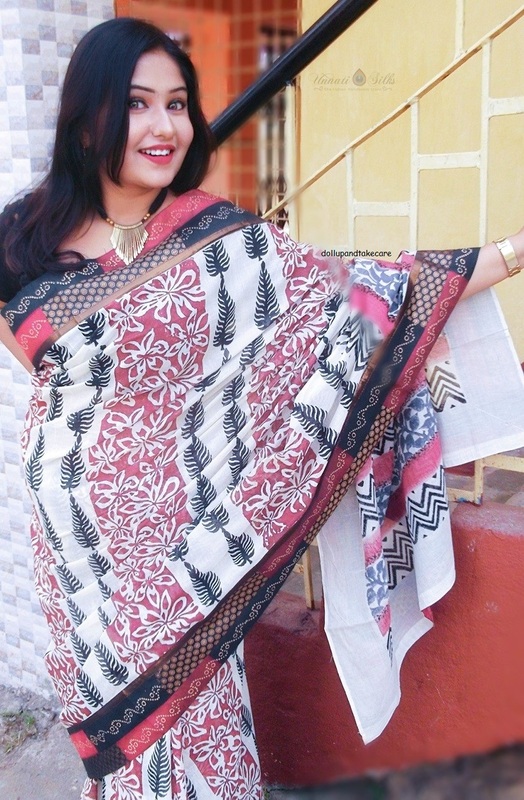 What is unique about the Cotton Block Print Patch Saree? The unique thing about this saree is ,this is a multi-age wear . 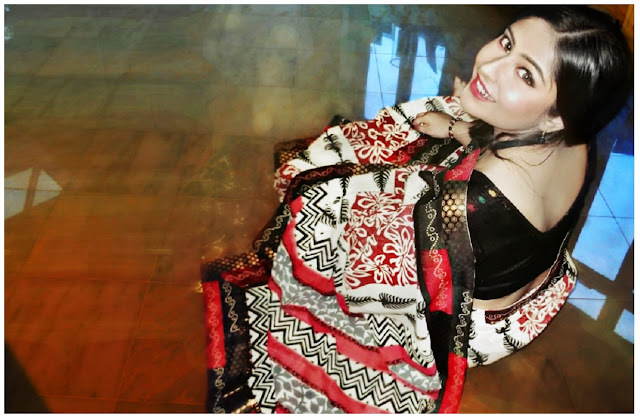 From Early 20s to Aged lady,this saree will suit every one . weather only cotton is comfort zone friendly . it for occations specially morning occations . this saree will make the best possible Outfit Of The Day. Styled the Saree with Cotton Chanderi Black Blouse . 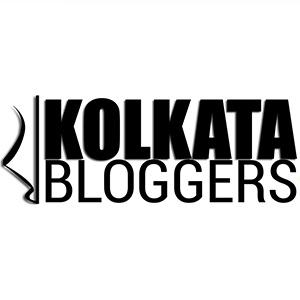 I shall come back soon with new post till then keep showering your love .